If you’ve been following along throughout the years, you are already aware that I refer to myself as completely soup obsessed. Year round. It’s an all-seasons meal for me. In every soup recipe/post I share, I end up ranting and raving about how much I am completely in love with the meal of soup. And this post (sorry!) is not going to be much different. At least I’m consistent, right? This crock pot pork stew is MADE for this early fall weather. It takes minutes to prep and results in the richest, most delicious pork stew I’ve ever tasted. Yup, that’s right. This, right here, is the best pork soup I’ve ever had. And it will warm you right up on a chilly fall evening! It’s hearty as can be. The crock pot does all the work but still results in a meal that tastes like you slaved away for hours. The pork is so ridiculously tender and flavorful; it falls apart at the touch of a spoon. The broth is heady with flavor. And the textures! Oh my gosh. The textures. There is something for everyone. The broth is infused with one of my favorite store short cuts: bottled salsa verde. In these parts, it’s really hard to find decent tomatillos, let alone AFFORD said tomatillos, so I have actually never made salsa verde from scratch at home. Believe me, if I could, I would! Because I love the stuff. It’s an incredible mix of tangy and salty and smoky and spicy. I put it on everything. Adding it to this stew as a part of the braising liquid was a really good move. It imparts so much flavor from the get go! I love this trick and probably will be using it time and time again (AND it’s actually not the first time I’ve done it). This stew is my take on pozole. I call it verde because of the salsa verde and because of the way I like to serve it: with lots of green garnishes! 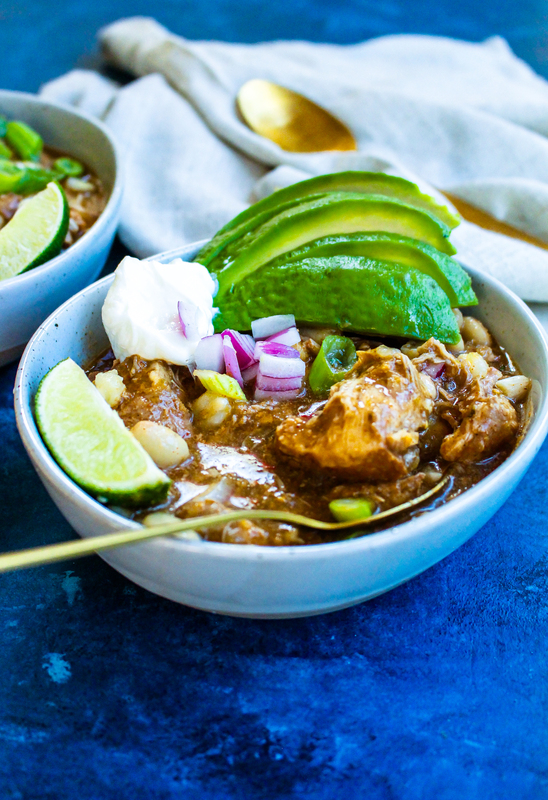 It’s so pretty, and such a fun and unique twist on pork stew. 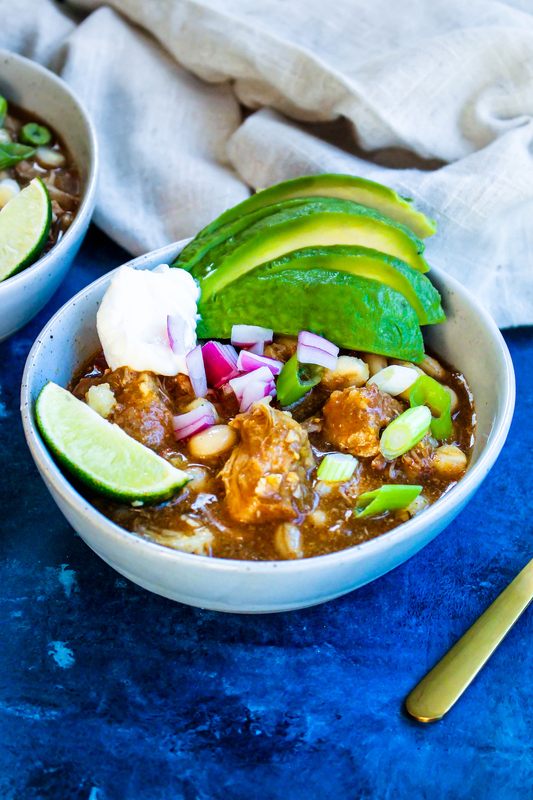 The hominy is really the special ingredient here (and what makes it pozole! ), and I highly, highly recommend you get your hands on some if you’ve never cooked with it before. You can buy it canned or dried at most grocery stores (try the “International” aisle. My local store stocks it along with the rest of the canned beans and veggies). I went with a canned variety for this stew because I really wanted to make this as “hands off” a recipe as possible. If you have the time/inclination, though, go for the dried hominy. It’s probably even more delicious. The hominy adds a subtle corn sweetness to the otherwise very savory stew, which is awesome. But more importantly, it adds an incredible texture! A texture you can only get from hominy! It reminds me of a slightly chewier, starchier version of a bean. It tastes like cornmeal and beans in one. And that sounds pretty great to me! Another short cut I took here? I had the butcher at the store cut up my pork shoulder for me. It made ALL THE DIFFERENCE in the world in terms of ease and time savings! I cannot recommend this enough. It doesn’t cost anything extra, and most meat counter workers I’ve asked to do this sort of thing before have been more than happy to oblige. It saved me 5-10 minutes of butchering AND a dirty cutting board. Gotta love that. 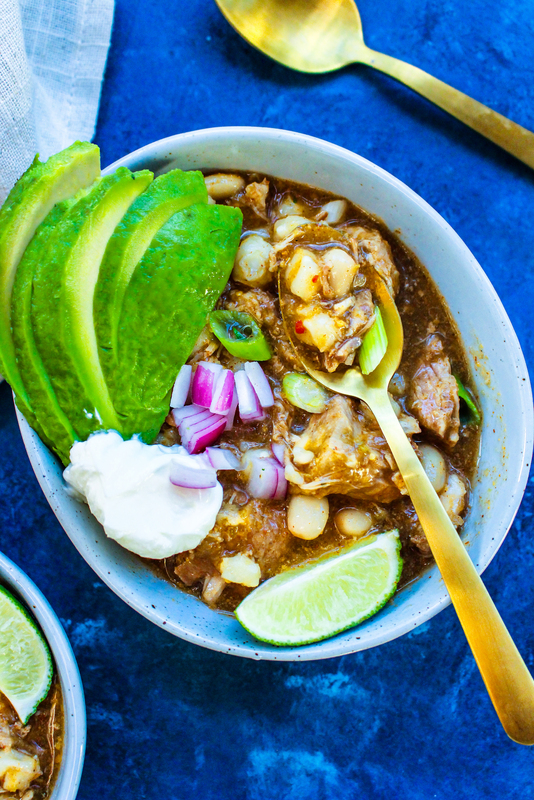 You basically put the pork in the pot with the salsa and some broth and cook it low and slow in it’s own juices until it is fall-apart tender. Much like any other pulled pork recipe. After you shred the pork in the pot, you make it into a soup/stew by adding in additional broth and all the other textures and flavors needed to make this awesome. You’re basically just building on all the awesome flavors that have developed from cooking the meat itself. So simple. And so mouthwateringly good. We happily ate this for a few nights in a row, and my husband (who is not NEARLY as obsessed with soup as I am) expressed extreme disappointment when it was gone. I gave some to my mom, as well, and she raaaaaved about it. She said it was one of the best stews she has ever had. So, don’t just take it from me that this one is a winner. The proof is in the pork, people. 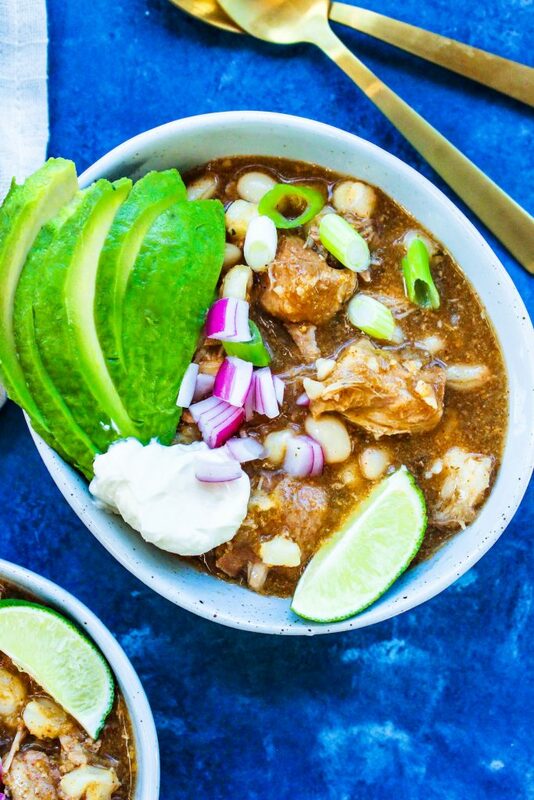 In the bottom of a slow-cooker or crock pot, stir together the salsa verde, 1 cup of the chicken stock (save the rest for later), onion, garlic, spices, sugar, red pepper flakes, salt, and pepper. Add the pork and turn to coat in the salsa mixture. Cover the pot and cook on LOW for 8 hours or on HIGH for 6 hours, or until the pork is falling apart. 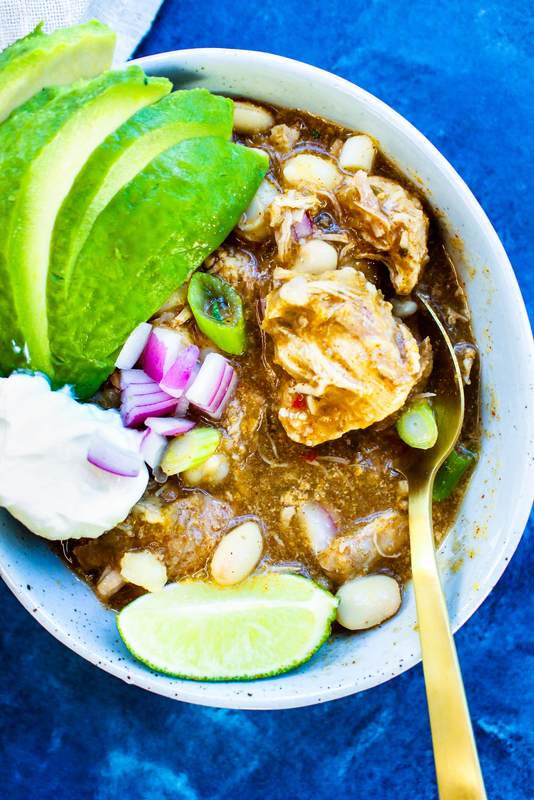 Shred the pork in the pot and then stir in the remaining chicken stock, hominy, beans, lime juice, and cilantro. Season, to taste, with additional salt and pepper. Cover and cook for another hour on HIGH (another 2 hours on LOW). 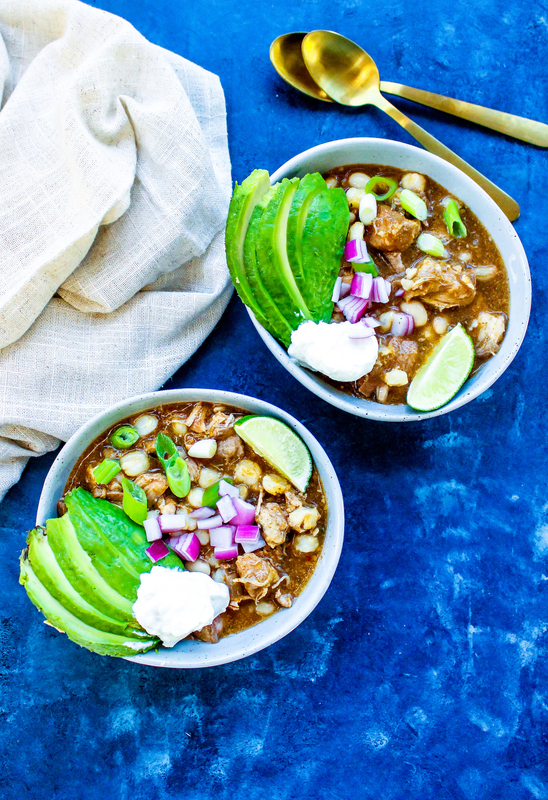 Ladle the soup into bowls and garnish with additional cilantro, lime juice, avocado, radishes, and cheese. Serve hot.